I admit it, when you think of all the wonderful things there are to eat in Paris, Fallafels may not spring to mind. On our Valentine’s Day trip to Paris last year Franck and I had a lovely stroll in the Marais topped off by a Fallafel for lunch on the Sunday before heading back down to Burgundy. That Fallafel was so damned good that I actually DREAMED about it for several nights afterwards. I am thinking of rerouting our usual flights to France from Lyon through to Paris (and brave Charles de Gaulle) just so I can stop off in the Marais and eat a Fallafel. They are the stuff of which obsessions are made. 1. The best place to buy Fallafels in Paris is in the rue des rosiers – the Jewish quartier which is extremely interesting and worth a visit in its own right. The best Fallafel place is hands down “L’As Du Fallafel” in the rue des rosiers as seen in the photo below. Just one look at the lunch-line up will confirm this assertion. If you get lost, just follow la foule, and you will find your Fallafel. 2. If the line-up is big, an employee will come down the line and take your order and give you a ticket in exchange for payment (my advice, bring cash). They are not trying to rip you off – this is just part of the extremely efficient lunch-time system they have devised. 3. After you have devoured your delicious and very Kosher Falaffel, head across the street to what has to be one of my very favorite Boulangeries / Pastry shops in Paris for an unbelievable Jewish pastry. The entire lunch will only set you back about 10.00 Euros per person, and it will guarantee many happy Fallafel dreams to come. 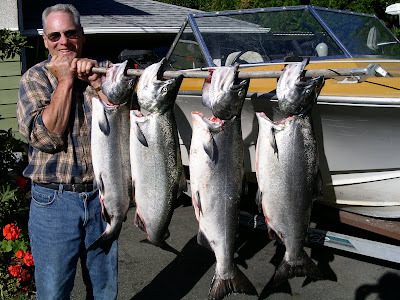 This entry was posted in Authentic France Travel Tips on September 22, 2009 by admin. 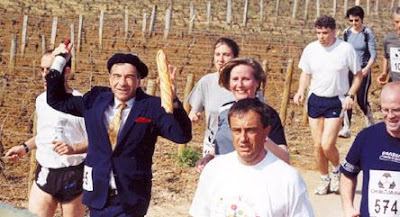 Remember when I took part in last March’s Nuits-Saint-George’s Wine Auction 10 Kilometre race? 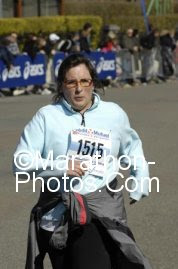 This was me, wheezing my way to the finish line. I have to admit I wasn’t motivated by an inner sense of competitiveness, or by accomplishing a long-held goal, or even by getting fit. This is the bottle of wine I received, like every participant, for finishing the race. This is what kept me huffing and puffing all those kilometres. Well, that and the cool race T-shirt that I still wear almost every time I run. Frankly though, I was at no risk of choosing the water, even without his sage advice. But – never fear – there are still a few spots left for those of you who want to experience this fabulous alternative universe for yourself. Just email Franck or I if you have any questions or if you would like us to reserve your place. Burgundy’s wine-sponsored races don’t seem at all strange to the French, who truly, unequivocably belive that things like Burgundy’s fine wines and running go hand in hand to create a healthy, satisfying life. This entry was posted in Burgundy and France Travel Info., Frenchitude Fridays on September 18, 2009 by admin. For you wine-lovers out there, here is insider information in regards to Burgundy’s 2009 Vintage. The harvesting is just drawing to a close all over Burgundy. The summary below comes straight from my friend Charlotte who is celebrating the traditional “Paulée” that marks the end of harvest with all of the vendangeurs that worked at the family’s Domaine – Domaine Buffet in Volnay probably…well, probably at this very moment as a matter of fact! This translates that her husband, who is the Domaine’s winemaker, is very happy with the superb quality of the grapes which are both high in sugar and troubled by very few cases of rot or mildew. 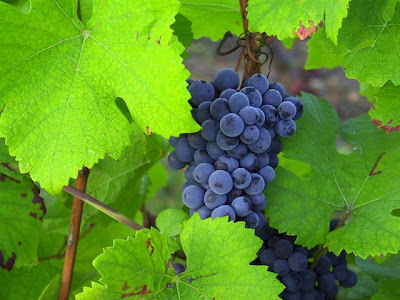 The good news from the harvest has been pouring in throughout this week all over Burgundy. The overwhelming consensus is that 2009 is a Burgundy vintage to watch for in the years to come. Some are saying that it may prove as good, or even better, than the now-famous (and long-ago sold out) 2005 vintage. This entry was posted in Beaune Wine Cellar Project, Burgundy and France Travel Info., Wine-Related Posts on September 16, 2009 by admin. This entry was posted in Culture Shock on September 9, 2009 by admin.